A hip-hop duo that many of you have probably never heard of has this week's top new entry on The Billboard 200. Macklemore & Ryan Lewis debuts at #2 with The Heist. The album debuts higher than new albums by such household names as Kiss (which was hoping to finally land its first #1 album) and Barbra Streisand (who was hoping to extend her streak of a #1 album in each decade). Macklemore & Ryan Lewis seemingly came out of nowhere. As late as Wednesday morning, Wikipedia.com, which has an entry for just about everything, had a notice threatening to take down the entry for The Heist on the grounds of "notability." Here's what it said: "The topic of this article may not meet Wikipedia's notability guide for music. Please help to establish notability by adding reliable, secondary sources about the topic. If notability cannot be established, the article is likely to be merged, redirected or deleted." I assume entering The Billboard 200 at #2 (ahead of Kiss and Streisand) constitutes "notability." The Heist sold 96K in its first week, which is more than six times as many copies as Macklemore's previous full-length album, 2005's The Language Of My World, has sold in its entire run (15K). The Heist sold 65K digital copies this week, which enabled it to displace Mumford & Sons' Babel from the #1 spot on Top Digital Albums. 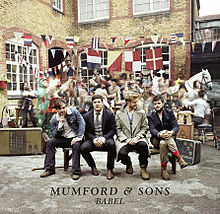 Mumford & Sons' Babel tops The Billboard 200 for the third straight week. It's the first album to spend its first three weeks at #1 since Eminem's Recovery was #1 for its first five weeks in 2010; the first rock album to do so since Metallica's Death Magnetic in 2008. Babel has sold 865K copies in its first three weeks. It's already #5 on the year-to-date chart. It's on target to become the first rock album to rank among the year's top five best-sellers since 2008, when Coldplay's Viva La Vida Or Death And All His Friends, Kid Rock's Rock N Roll Jesus and AC/DC's Black Ice ranked #2, #4 and #5 for the year, respectively. Babel returns to #1 on The Official U.K. chart, after being displaced last week by Muse's The 2nd Law. 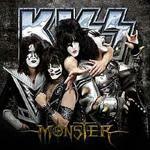 Kiss' 20th studio album, Monster, debuts at #3. The band had been hoping for its first #1 album, a mere 38-1/2 years after it first cracked The Billboard 200. Kiss shouldn't give up hope: Tony Bennett waited more than 54 years from when he first hit The Billboard 200 to when he finally hit #1 last year with Duets II. Stay strong, Kiss. Monster is Kiss' ninth album to reach the top 10. It's the band's third studio album in a row to make the top three, following Psycho-Circus (#3 in 1998) and Sonic Boom (#2 in 2009). This is the first time in the band's history that it has made the top 10 with three consecutive studio albums. Kiss first cracked the top 10 in December 1975 with Alive!, giving the band a nearly 37 year span of top 10 albums. Incidentally this is the second time that an album titled Monster has made the top 10. R.E.M. 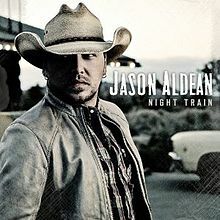 debuted in the top spot with an album by that title in October 1994. MGK's debut album Lace Up debuts at #4. The initials stand for Machine Gun Kelly. (The rapper's real name is Colson Baker.) MGK hit #46 with an EP, Half Naked & Almost Famous, which has sold 42K copies. Lace Up includes "Wild Boy" (featuring Waka Flocka Flame), which has climbed as high as #98 on the Hot 100. It also includes collabos with Tech N9ne and Lil Jon. Coheed and Cambria's concept album The Afterman: Ascension debuts at #5. This ties the band's 2010 album, Year Of The Black Rainbow, as its highest-charting to date. This is C and C's fourth top 10 album in a row. (They're the real C & C Music Factory—an inside reference for readers who remember the early '90s.) This is the first of two planned volumes. The Afterman: Descension is due in February. Will it become the group's fifth top 10 album? Stay tuned. All Time Low's Don't Panic debuts at #6. It's the group's third top 10 album, following Nothing Personal (#4 in 2009) and Dirty Work (#6 in 2011). 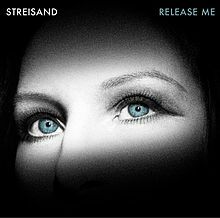 Barbra Streisand's Release Me, a compilation of previously unreleased tracks, debuts at #7. It's her 32nd top 10 album. Fun With Numbers: Streisand first cracked the top 10 in July 1963 with her debut album, The Barbra Streisand Album. She landed her 16th top 10 album, Wet, in November 1979. So it took her a little more than 16 years to land her first 16 top 10 albums, and 32 years to land her next 16. This reflects both how red-shot she was in the '60s and '70s and the faster pace of album releases back then, especially in the '60s. Streisand is the only solo artist to land a #1 album in five different decades (from the 1960s to the 2000s). If Release Me had debuted at #1, she would have extended her streak to six decades. Fortunately, Streisand has more than seven years to achieve this feat. Taylor Swift's "I Knew You Were Trouble" enters Hot Digital Songs at #1. It's Swift's sixth #1 hit on the digital sales chart; her third in the past two months. The song sold 416K copies in its first week, which constitutes the fourth biggest opening of the year, following Swift's "We Are Never Ever Getting Back Together" (623K), Justin Bieber's "Boyfriend" (521K) and "Payphone" by Maroon 5 featuring Wiz Khalifa (493K). PSY's Gangnam Style rebounds from #4 to #2 on Hot Digital Songs. Will it jump to #1 on this week's Hot 100? I believe it will. We'll find out for sure later today when we post Chart Watch: Songs. The Top Five: Mumford & Sons' Babel holds at #1 for the third week (96K)…. Macklemore & Ryan Lewis' The Heist debuts at #2 (78K). It's the duo's first top 10 album…Kiss' Monster debuts at #3 (56K). 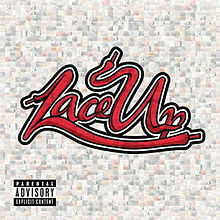 It's the band's ninth top 10 album…MGK's debut album Lace Up debuts at #4 (51K). It's the rapper's first top 10 album…Coheed and Cambria's The Afterman: Ascension debuts at #5 (49K). It's the band's fourth top 10 album. The Second Five: All Time Low's Don't Panic debuts at #6 (48K). It's the band's third top 10 album… Barbra Streisand's Release Me, a compilation of previously unreleased tracks, debuts at #7 (44K). It's her 32nd top 10 album…P!nk's The Truth About Love drops from #4 to #8 in its fourth week (36K)… Ellie Goulding's sophomore album, Halcyon, debuts at #9 (34K). It's her first top 10 album… Muse's The 2nd Law drops from #2 to #10 in its second week (31K). Seven albums drop out of the top 10 this week. Miguel's Kaleidoscope Dream drops from #3 to #11, Three Days Grace's Transit Of Venus drops from #5 to #25, Diana Krall's Glad Rag Doll drops from #6 to #17, Jackie Evancho's Songs From The Silver Screen drops from #7 to #16, Little Big Town's Tornado drops from #8 to #14 (It's #1 on Top Country Albums for the fifth week), Cher Lloyd's Sticks & Stones drops from #9 to #38, and Van Morrison's Born To Sing: No Plan B drops from #10 to #23. The Script's third album, #3, debuts at #13. This is a disappointing debut: Science & Faith reached #3 in 2011. The album reached #2 on the Official U.K. chart. The band's first two albums both reached #1 in the U.K. "Hall Of Fame" (featuring will.i.am) leaps from #96 to #71 in its third week on the Hot 100. 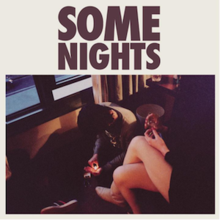 .fun's Some Nights rebounds from #23 to #19 in its 34th week. The album has climbed as high as #3. The album advances to #10 on the year-to-date chart. It's #2 for the year-to-date among rock albums, trailing only Mumford & Sons' Babel. The Beatles' Magical Mystery Tour enters Top Music Videos at #1. The deluxe box set consists of a Blu-ray, DVD and double vinyl EP. 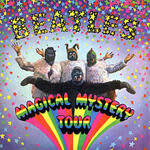 Magical Mystery Tour is the fifth Beatles title to reach #1 on the music video chart. It follows The Compleat Beatles (two weeks on top in 1996), The Beatles Anthology (four weeks in 1996 and two weeks in 2003), First U.S. Visit (two weeks in 2004) and The 4 Complete Ed Sullivan Shows (three weeks in 2010). The release of the video boosts the Magical Mystery Tour album, which re-enters The Billboard 200 at #56. 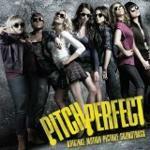 It also re-enters Top Catalog Albums at #1. The album sold 8K copies this week, bringing its total since 1991 to 1,885,000. The album topped The Billboard 200 for eight weeks in January and February 1968. It received a Grammy nomination for Album of the Year. The Beatles introduced six songs on the soundtrack, including "I Am The Walrus" (which was released as the B-side of "Hello Goodbye") and "The Fool On The Hill" (which became a top 10 hit in 1968 for Sergio Mendes & Brasil '66). Rodriguez, the 70-year old folk musician who is the subject of the current documentary Searching For Sugar Man, has two albums in this week's top 100. The Searching For Sugar Man soundtrack jumps from #109 to #75 in its second week. His 1970 album Cold Fact jumps from #113 to #90 in its second week. Rodriguez, the American-born son of Mexican immigrants who became a star in South Africa without his even being aware of it, was profiled on 60 Minutes on Oct. 7. Coming Attractions: Jason Aldean's Night Train is a lock to debut at #1 next week with sales in the 400K range. Brandy's Two Eleven will probably debut at #3 (65K). Scotty McCreery's Christmas With Scotty McCreery may start at #4 (35K). Jamey Johnson's Living For A Song: A Tribute To Hank Cochran will probably open at #6 (27K). Also due: Anberlin's Vital (17K), Metalocalypse: Dethlok's DethAlbum III (15K) and Donald Fagen's Sunken Condos (14K).